Christopher M. Finan received Eli M. Oboler Memorial Award for 2008. The award is presented for the best published work in the area of intellectual freedom. Eligible books were published between 2006 and 2007. In 1919, Attorney General A. Mitchell Palmer launched a government roundup of thousands of Russian immigrants and deported 800 of them for their radical ideas, a flagrant violation of First Amendment rights. Decades later, a second Red Scare gripped the United States as Senator Joseph McCarthy spearheaded a witch-hunt for Russian agents while sneering at "egg-sucking liberals" who defended "Communists and queers." The nearly century-long battle between heresy hunters and civil libertarians makes the story of free speech in this country a colorful one, filled with dramatic episodes and larger-than-life personalities. Historian and free-speech advocate Christopher Finan introduces us to a cast of characters as varied as a young G.I. named Hugh Hefner and the ever-vigilant Emma Viets, chair of the Kansas City censorship board, who cheerfully cut scenes that weren't "clean and wholesome" from Hollywood films, shortening onscreen kisses and excluding any image of a woman "in the family way." This history has enormous relevance in post-Patriot Act America. At a time when government is warning citizens and the press to watch what they say, the words of Murray I. Gurfein, a judge from another era, have special resonance: "The security of the Nation is not at the ramparts alone. Security also lies in the value of our free institutions. A cantankerous press, an obstinate press, a ubiquitous press must be suffered by those in authority in order to preserve the even greater values of freedom of expression and the right of the people to know." From the Palmer Raids to the Patriot Act traces the fight for free speech from the turn of the nineteenth century through the War on Terror. 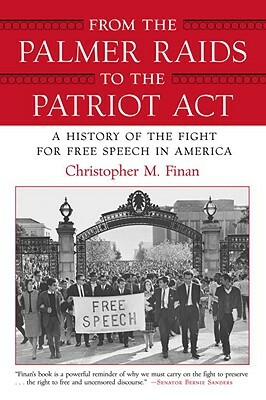 Christopher Finan has given us a vital history of our most fundamental, and most vulnerable, constitutional right.